Rebuild a small village with your stylus, drawing the planets, animals, plants, buildings, sun, moon, stars and much more! Watch as your creations interact in the streets with the town population! Control your drawn hero, and follow a colorful cast of characters, as you help bring their village back to life! Jump, fly, swim and battle your way through dark forests, snowy mountains, busy cities and tropical islands. Draw objects to help you progress, and collect numerous secret items to further customize your character. Drawn to Life provides a powerful, yet easy-to-use paint set, including multiple 25 color palettes, eraser, multiple zoom modes, per pixel editing, three brush sizes and flood fill. if you are creative, you have got to love this game. It's a cross between Mario\Animal Crossing type of game. Great for girls and boys. Draw your own hero, weapon, forest, even planet!! Your goal is to defeat the darkness, and this guy named Wilfre. Interact with characters, and literally shape\draw your destiny!! overall, you should definetly buy your kid this game. They will love it!! You play the game as "The Creator" and it is your job to save a small village of people/creatures/things by drawing the pizzazz back in to their little world which has become dark and gloomy and rescuing the townsfolk. Well this sounds kind of cool doesn't it? Too bad it's really not. The game opens up with the pages of a book that apparently has been destroyed by one of the villagers who has gone evil. You are prompted to draw a few things, and I'm not sure what bearing they have on the gameplay yet, and then you are thrown in to a little Animal Crossing like world that is gloomy and fenced off with patches of dark fog. They talk about some nonsense for a while and eventually you get around to drawing a "hero" which you can pretty much do anything with. You're given a certain space built up of smaller regions that you can neither draw outside of or leave an individual region blank. This is to assure that your hero has 2 "legs", 2 "hands", a "head", and so forth. Naturally you can give them round stubs for hands and pineapples for legs if you wanted to but certain bits have to be there. There are also predrawn templates you can simply alter to your tastes or use them as they are. All in all I would say the drawing tools are simple but effective. You can zoom in/out, use a fill tool, there's a couple of different pencil widths, and there's a stamping tool. For the stamps and templates you only start with a given number and the rest must be unlocked. Once done, you may alter your hero whenever you see fit so don't worry about it too much. So you've got your hero and you may now be saying to yourself, "Well he/she/it certainly is ugly" and you'd be right. Your drawn hero only has the 2D view and kind of flails around. This makes for a poor contrast to the rest of the game sprites since they all have a back, front, and side view. Whatever though, it works, it's just not pretty. With your hero you can now move on in to the saving of townsfolk and the recovery of the pages from the book of life. You enter in to side scrolling platform levels with your hero and there's really nothing new here. You jump on enemies to kill them, you can slide down hills to kill them, you collect coins for spending later in town, and you bounce around like this achieving various goals. There's really no additional flare to what it basically Mario 3 with the exception that every so often you are asked to use your drawing skills to move on. For example you may have to draw clouds that you can jump on. You also get various weapons which you are allowed to design yourself but I still found myself jumping on enemies more often than not even with weapons. The mechanics are a little wonky, your character seems to skate around and something about the feel of the movement is just slightly awkward. What you draw simply fills in templates already in the world. You don't draw enough to really set the flavor of the setting, and all the drawing is simply filling in blanks in the background. My son is 8 and really enjoys this game! This is a great game! You can draw your own character and parts of the levels. The Drawing Tool is in depth, you can zoom in and edit each pixel, flood fill, lock colors and choose from a bunch of different stamps and patterns... I've been playing this game for awhile and still haven't unlocked everything!!! It has a cool story and interesting characters, and the music is amazing! I enjoyed this game. I don't quite have it finished yet but I'm to the last part. This game is a platform game with a big twist. I'd say it is a platform come RPG Come drawing game. As I saw from one other reviewer it's much like a coloring book but not quite. The game has a story line and you get to draw and color a lot of stuff in the game including your Character (or you can as he/she said use a template). Personaly I really ejoyed the drawing part. In fact I wish we would find more games (RPG's in particular) that allowed the drawing/teplating choice for stuff in the game. This game is great fun!!!! I do not do well with platform games as a general rule having said that (and I did not do well on this one either) lol. it took a long time for me to get to the end. But it is still great fun and like I said it's a combination platform/RPG and coloring drawing game. I do not think that just kids would ejoy this game. I belive Adults will too. I think it's cool that this game allows you to do some drawing and have some fun while playing a somewhat actiony game, but find it lame that a majority of the things it gives you to "draw" (color) are already pre-drawn, you just get to color them in. The game is slightly frustrating at points, as the further you go in it, the harder it gets. Thankfully I found the cheats and it's super easy now. Haha. I also don't like that a majority of it is talking and going through the town trying to find people you've JUST spoken to. There should be a "skip dialouge" feature. In my ongoing quest to keep myself from constantly remembering that Halo 3 comes out in 3(!) days, I picked this up a little while ago. I'd rate this game as flatly average, but maybe exotic enough to justify picking up anyway. You play as "The Creator," a not-apparently-too-omnipotent deity for a bunch of cute furry things, the Raposas. Darkness has come to their land, and it is up to you to restore its color through your creative powers. Using the touchscreen, you "draw to life" things the Raposas need, such as the sun, crops, etc... Additionally, you craft items, tools, and conveyances for yourself to get through the world. To do this, you must first acquire pages from the "book of life" by venturing out into the darkness with your avatar, "The Hero," and recovering the pages from the malevolent forces that have closed in. Adventuring outside the village takes the form of a standard platformer, and this is the game's biggest problem because I'm willing to wager that many players will consider this to be the crux of the actual game. 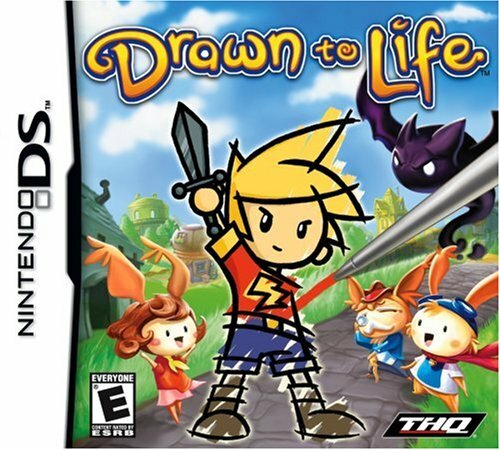 The platforming isn't bad, it's just not original---it seems obvious to me that the designers didn't want to scare people away from the fun drawing game by making the action game too hard. The platforming feels too long because the drawing game occurs in the middle of levels from time-to-time. For someone accustomed to a "level" in a platforming adventure being about a ten-minute experience, that's a little draining. Sure, it's a DS game so you can always slap the lid shut and go, but that's hard to get used to, especially when stopping mid-game can make you lose your mental map of the area. Speaking of which, for a game that involves drawing unique items, the level designs are pretty repetitive. This is something that they could have done better... At least give me the ability to draw trail markers into the world so I can realize more easily that I'm retracing my steps. It's clear that they spent the most time on the drawing aspect of the game, and this was done well enough. There are certainly no hardware problems, which is good; the DS screen supports this type of gameplay perfectly well. The drawing toolbox is good but a little sparse; I would have liked a couple of power tools like a pixel-mixer, color-replace, cut-copy tool, or even a blur filter if they were feeling sassy. The most powerful tool in my kit is the lock tool, which allows me to designate one color at a time as 'locked' and therefore unmodifiable, which makes clean edges easier to obtain. Photoshop... this is not. Also, and this is a minor nitpick... Given the amount of time you spend in this screen, I would have liked more than one music theme for "Hey, let's draw!" If I'm trying to race down a mountain and I'm sketching myself a quick snowboard to do the job, I would have done the music tense, not jaunty. What the game does get right is the use of the drawings. The game has you draw many elements of the world, including your own avatar, the vehicles you use, the weapons you wield, and even the game's title screen. The game screams "customize me," and that's enjoyable. Thematically, the game is a little kiddish, and possibly even---surprisingly---a little art-confused. Since the toolkit you're given is more on par with Mario Paint, most of the drawings you do come off looking very "Crayola fun day." This makes your own creations stand out in sharp contrast to the higher detail of the game's built-in art, which looks more like "Secret of Mana." If I'd been the director, I'd have themed this one more like "Yoshi's Story" to make it easier for the player's work to blend into the scene. On the other hand, the decision they made causes the player's art to stand out more, which may have been the goal all along. To sum up? This game is fun enough, but it won't hold my attention when Halo 3 comes out. I can't say anything bad about a feature that allows me to play through the game as Sephiroth in powered armor wielding a gun that shoots exploding acorns. If I don't finish this game, it won't be a failure of the titular drawing feature but of the mind-numbing platforming. But overall, I'm impressed. I generally find drawing and coloring to be an entertainment experience on a level somewhere between watching paint dry and mowing the lawn; the fact that I haven't dissolved this game in turpentine and wandered off to kill my thirty-eight thousandth Spartan is testament to the good work the developers did. My Favorite Game Yet !!! !